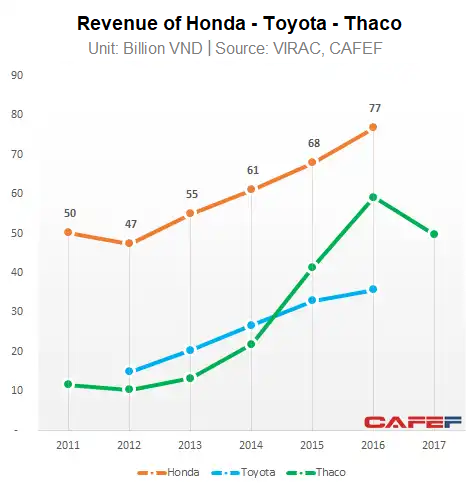 Despite of high growth in car industry, Thaco and Toyota’s profit is still minor when placed next to 16,000 billion VND interest of Honda Vietnam. Even if motorbikes have declined in many big markets like China or Indonesia, the demand for this vehicle is still growing in India and Vietnam. For many years, Truong Hai – Thaco Auto Joint Stock Company and Toyota Vietnam have together ranked the top of the Vietnam automobile market with more than 60% market share of the Vietnam Automobile Manufacturers Association – VAMA. The market’s rise in recent years has made the business results of two leading companies in this industry grow with galloping speed, both in revenue and profit. Before slowing down in 2017, Thaco’s profit jumped from 265 billion VND in 2012 to more than 8,500 billion VND in 2016. Also in the 2012-2016 period, Toyota’s profit increased from 1,500 to 7,100 billion VND. Compared to other big enterprises in the industry such as Hyundai Thanh Cong, Ford, Mercedes-Benz, GM Vietnam, Thaco and Toyota have made a quite long distance. However, as compared to Honda, which is dominating the Vietnamese motorcycle market, the business results of Thaco and Toyota become small. Honda is also one of the automobile brands with the high market share in the country, but the proportion of car business of Honda in Vietnam is quite modest in the car segment comparing to motorbike segment. 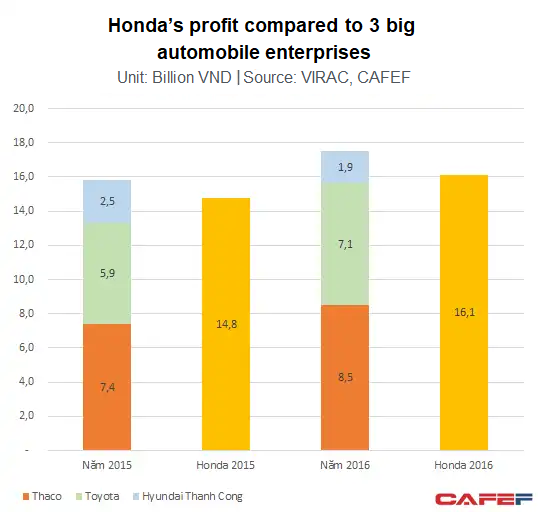 In 2015 and 2016, Honda’s pre-tax profit was VND14,800 billion and VND16,100 billion respectively – roughly equal to the total profit of the three biggest automobile enterprises, namely Thaco, Toyota and Hyundai Thanh Cong combined. Hyundai Thanh Cong is a large assembling and trading automobile enterprise which is not a member of VAMA. According to data provided by Viet Nam Engine and Agricultural Machine Corporation (VEAM – the domestic partner holding 30% Honda Vietnam’s capital), announced that Honda Vietnam sold 2.33 million motorcycles in 2017 –increase of 7% compared to the figure of 2.15 million cars in 2016 and accounted for about 72% of Vietnam motorcycle market share. Honda Vietnam also consumed more than 12,100 automobiles in 2017, accounted for 4.8% of the market share. In particular, in the first five months of 2018, Honda’s car sales doubled in the same period to 8,900 vehicles, surpassing Fordto became the third largest market share owner in VAMA with 8.8% market share. Although car consuming is growing, the demand for motorcycles in some Asian countries is still high. The annual report of Honda showed that motorcycle demand in Asia is still increasing 2% to 39.76 million vehicles in 2016, thanks to the strong growth of some countries such as Vietnam, India, Pakistan, Thailand despite the decline of some big markets such as China or Indonesia. Vietnam is the market with a highest growth rate of 10% to 3.12 million cars.